This page is written for non-medically trained people. It is not written for or intended for use in litigation. Hearing loss is not normal or common. According to US government statistics from the 60's (National Center for Health Statistics), only 8% of the entire US population has any difficulty with hearing at all. Furthermore, only 3% of the population had difficulty hearing anything other than faint speech. Thus, having problems hearing is not something that "everyone has". Rather, it is a significant sensory loss. Severe hearing loss is not nearly as common in young people. Unilateral hearing loss is estimated to have a prevalence ranging between 0.1 and 5% in school aged children (Barsky-Firsker and Sun, 1997; Niskar et al, 1998). In US data between 1988 and 2006, mild or worse unilateral hearing loss (25 db or worse), is reported in 1.8% of adolescents. Mild or worse bilateral loss, in 0.8%. (Shargorodsky et al, 2010). On the other hand, there is an epidemic of hearing loss in older people. Between 25 and 40% of the population aged 60 and older is hearing impaired. Not only is hearing loss more common in older persons, hearing loss is also increasing with time (Yueh et al, 2003). As the population ages, the population's hearing is certain to worsen. In England, 10.7% of adults have significant hearing impairment (Dawes et al, 2014). There was greater risk in individuals with work exposure to loud noises, lower socioeconomic background and in ethnic minorities. If you have trouble hearing, if you are young, you are at a competitive disadvantage. Adults with hearing loss are more likely to be unemployed and earn less wages (Jung and Bhattacharyya, 2012). If you are older, statistics say that while many of your older associates may have the same problem, it will probably get worse, so you should prepare yourself and do your best to slow down the rate that it gets worse. An early sign of hearing loss is difficulty hearing speech in noise. For example, having problems conversing in a noisy restaurant or at a party. The "audiogram" just covers a few frequencies and there is quite a bit more to hearing than that. There are many subcategories of this -- problems with the input, with the brainstem processing, with cortical processing among others (Pienkowski, 2017). We think the main cause is wear/tear on the cochlea (i.e. input system). This page provides a general overview for the diagnosis and evaluation of hearing loss. This is the first step to take if you have a hearing issue. Other pages on this site deal with treatment. The healthy ear processes sound frequencies ranging from 20 Hz to 20,000 Hz. It detects sounds as soft as .0002 dynes/cm**2 (0 DB HL) and can tolerate sounds a million times more intense (200 dynes/cm**2 or 120 DB HL). Sound frequencies between 500 and 4000 Hz include the frequencies most important for speech. Figure 1: Animation of normal hearing. Sound waves are first collected in our outer ear (called the auricle or pinna), pass through our ear canal and cause our eardrum to vibrate. These vibrations are in turn transmitted to our inner ear by the bones of our middle ear. Our inner ear plays a vital role in the transformation of these mechanical vibrations into electrical impulses, or signals, which can be recognized and decoded by our brain. When the vibrations reach the cochlea through movement of the bones in the middle ear, the fluid within it begins to move, resulting in back and forth motion of tiny hairs (sensory receptors) lining the cochlea. This motion results in the hair cells sending a signal along the auditory nerve to the brain. Our brain receives these impulses in its hearing centers and interprets them as a type of sound. The most important structures involved in hearing are shown on the figure below. The outer ear (pinna or auricle) may provide a modest (10db) amplification of sounds at the upper range of speech processing frequencies. The middle ear, bounded by the eardrum (1) and the bony labyrinth(5), provides an additional 20-30 Db of mechanical amplification by coupling the large eardrum (tympanic membrane) to the oval window into the fluid filled inner ear. The 20 to 30 db of amplification is approximately the difference in sound intensity between a whisper and normal conversation. Figure 2: The outer ear consists of the auricle (unlabelled), the external auditory canal, and the lateral surface of the tympanic membrane (TM). The middle ear includes the medial surface of the eardrum, the ossicular chain, the eustachian tube, and the tympanic segment of the facial nerve. 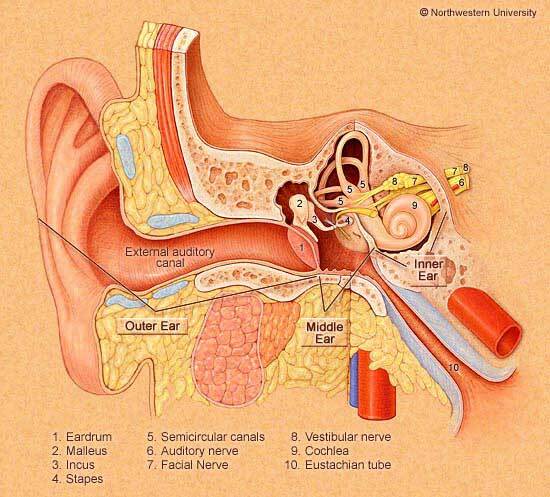 The inner ear includes the auditory-vestibular nerve, the cochlea and the vestibular system (semicircular canals). The auditory nerve, also called the cochlear nerve, transmits sound to the brain. Do you frequently say "what?" or "Huh?" Do you misunderstand names and numbers ? Do you like the TV/radio volume louder ? Do you have trouble hearing in noisy rooms ? There are three "pure" types of hearing loss encountered commonly in clinical practice: sensorineural, conductive, and central. A fourth type, denoted "mixed", is simply a combination of sensorineural and conductive. If you have a hearing loss, the first step is to get an audiogram. The audiogram is a graph of hearing (Y axis) vs frequency (X axis). Think of the diagram as being similar to the knobs on a stereo equilizer. "Perfect" hearing is having a "0 dB" score at all frequencies. Anything below 20 dB is significantly worse than normal. A 100 dB loss at all frequencies means you hear nothing. Hearing loss is also divided up by the timing. Sudden hearing loss occurs generally over days. Progressive hearing loss, may occur over months to years. Hearing loss is also divided up according to the frequency spectrum covered. For example, hearing loss associated with age is usually at the high frequencies. Hearing loss from noise is usually a notched pattern. There are only a few causes of low frequency hearing loss. If you have a hearing loss, the odds are such that you probably have a sensorineural loss. Sensorineural hearing loss (SNHL) accounts for about 90% of all hearing loss. If we do the math, 90% of 8% of the population with a hearing loss works out to about 7% of the population. Recently there has been an very reasonable attempt to separate "sensorineural" into "sensory" and "neural" types. However, for the most part, the mixed term "sensorineural" is used. Sensorineural deafness is sometimes also called "nerve deafness", although the term is certainly not accurate, as it leaves out disorders of the hair-cells of the inner ear. It is found in 23% of population older than 65 years of age. The term "sensorineural" is used to indicate that there is either a cochlear or an eighth nerve lesion. The diagnosis of a sensorineural pattern hearing loss is made through audiometry. In sensorineural loss, there is a significant hearing loss without the "air-bone gap" that is characteristic of conductive hearing disturbances (see below). In other words, air conduction is equal to bone conduction. Persons with cochlear deficits fail OAE testing, while persons with 8th nerve deficits fail ABR testing. 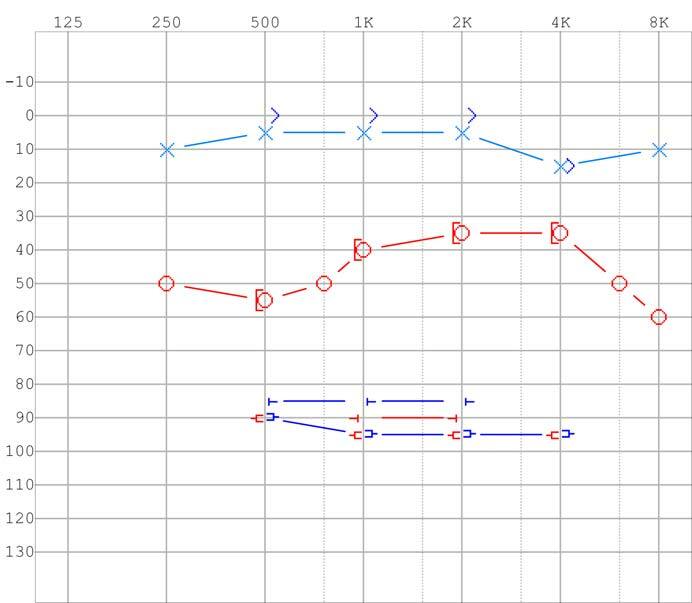 Audiogram of a sensorineural loss showing noise induced notch. Examples of conditions that cause bilateral (i.e. both sides) sensorineural hearing loss are noise and just living a long time. Generally speaking, there is often not much to do about bilateral hearing loss other than hearing aids. Examples of conditions that generally cause asymmetric sensorineural hearing loss (much worse on one side) are acoustic neuroma, Meniere's disease, and "SHL" or sudden hearing loss. Many of these problems have specific treatments. If you have a sensorineural hearing loss, your goal should be to find out why, if you can prevent it from getting worse, and if a hearing aid could help you in overcoming the impairments associated with hearing loss. In conductive hearing loss, the second most common form of hearing loss, sound is not transmitted into inner ear. If we do the math again, as only 8% of the population has a hearing loss at all, and 90% of them are sensorineural, this means that only 0.8% of the population has a conductive hearing loss. An example of conductive hearing loss is plugging up of the ear by ear wax. Other things that cause conductive hearing losses are fluid in the middle ear, and disorders of the small bones (ossicles) in the middle ear. If you have to have a hearing loss, it is best to have a conductive one, as these disorders are often fixable. The diagnosis is ordinarily made via observation of an "air-bone gap" on audiometry, meaning that hearing is superior when sound is transmitted in such a way that it bypasses the bones in the middle ear (the middle ear ossicular chain). Conductive hearing loss is considered in much more detail here. If you have a conductive hearing loss, your goal should be to find out why, if you can prevent it from getting worse, and if a hearing aid, surgery, or perhaps just wax removal might help you in overcoming the impairments associated with hearing loss. Central deafness is extremely rare compared to the conductive and sensorineural types. A discussion of central deafness is found here. Central hearing loss generally isn't helped to a great extent by medication or surgery, but preventing progression is important. Other methods of organizing hearing loss. Another common way to organize hearing loss is by the timing. Sudden hearing loss as well as Congenital hearing loss may be due to sensorineural, conductive or central mechanisms. Follow these links for more detail. When one looks at the audiogram, it is commonly described as one of several patterns. These can be used to rapidly sort audiograms and infer cause. Some of these associations are very specific (i.e. "peaked" and "trough") patterns, while others are very broad (such as "sloping" and "flat"). Margolis and Saly (2008) reviewed these patterns. 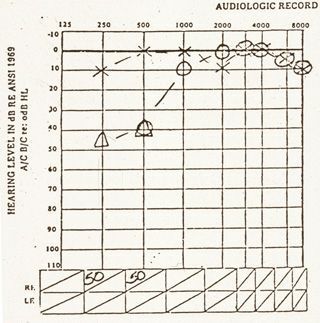 Figure 3a: Audiogram (hearing test) typical of early Meniere's disease on the right side (x=left, o=right). There is a low-tone sensorineural hearing loss on the right. Figure 3b: Peaked Audiogram typical of middle-stage Meniere's disease, again on the right side. Hearing is reduced at all frequencies, but more so at high and low frequencies. Figure 3c: Flat audiogram typical of late-stage Meniere's disease, again on the right side. Hearing is flat, and unaidable on the right side. Flat (sometimes "dead" ear, sometimes just all frequencies are down). Rising (if sensorineural, think Menieres. If conductive, think fluid or otosclerosis). Barsky-Firkser L, Sun S. Universal Pediatrics 1997;99(6):4th edition. Dichgans M and others. Bacterial meningitis in adults. Demonstration of inner ear involvement using high-resolution MRI. 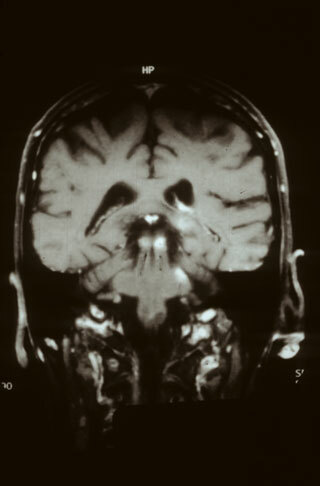 Neurology 1999, 52:1003-1009. Hoistad DL. and Hain TC. "Central hearing loss with a bilateral inferior colliculus lesion." Audiol Neurootol 8(2): 111-3. ,2003. Jung D, Bhattacharyya N. Association of hearing loss with decreased employment and income among adults in the United States .Ann Otol Rhinol Laryngol. 2012 Dec;121(12):771-5. Kitajiri S, Tabuchi K, Hiraumi H, Hirose T. Is corticosteroid therapy effective for sudden-onsent sensorineural hearing loss at lower frequencies ? Arch Otolaryngol HNS 2002:128:P365-367. This paper says that there is no difference between the treated and untreated group. Lieu JEC. Speech-Language and Educational Consequences of Unilateral Hearing Loss in Children. Arch Otolaryngol Head Neck Surg 2004;130(5):524-30. Yueh, B., N. Shapiro, C. H. MacLean and P. G. Shekelle (2003). "Screening and management of adult hearing loss in primary care: scientific review." Jama 289(15): 1976-85.